Listen, pretty much everyone can put together a red shirt and a pair of overalls. It's not hard. You probably already own that stuff already. But does that make it a Mario costume? Ha! Not by half. You think just because you're wearing overalls you can jump down a sewer pipe? We'd like to see you try. You think that red shirt makes eating weird mushrooms safe? Those mushrooms popped out of a brick! You can't eat those! And do you really think that Bowser, the most fearsome lizard-turtle-Godzilla (what is Bowser anyway? He's not really any one thing, is he? Huh. Something to think about.) 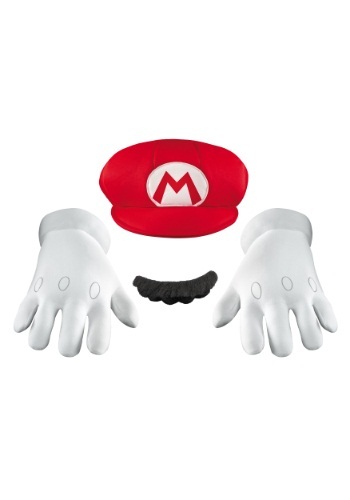 is going to just hand you Princess Peach when you show up without a mustache, or gloves, or the signature hat with an M on it??? Please! So quit trying to fool people into thinking you're Mario and just be him! Grab this hat, slap it on your head. Put your eager fingers into those gloves. Stick that mustache on your beautiful soft skin (actually, do this one first because it might be hard once those gloves are on). Now you're not just a Mario, you're a Super Mario! great costume accessories.just add some blue denim overalls and a red t shirt and plunger in your hand and your ready to go.